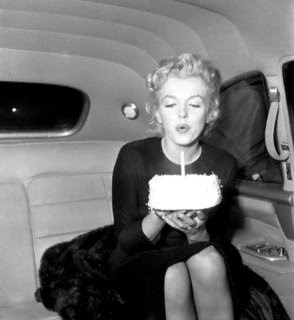 Thanks, Marilyn, for the birthday cake. But really, you don't have to sing for me. I mean, really, save that breathy birthday tune for Jack Kennedy or something. Believe me, if I wanted a celebrity to sing Happy Birthday to me it would be...oh, lessee...hm. Oh yes. I know. He doesn't sing worth crap. But he sure is purty to look at, you know? And thanks, too, to all of my friends for the electronic and virtual birthday cards and emails. To my coworkers for taking me out to lunch. For my sister and son who both called to sing Happy Birthday to me over the phone. My daughter who said it first. My parents who sent the check (thanks Mom and Dad!) and all of my MySpace and Facebook well-wishers. Whew. I think that about covers it! That cake makes me think about cupcakes. Have I mentioned that the Iron Cupcake Challenge for this month is drawing near? The entries are to be posted by the 24th. I have to get cracking. I'll likely post my entry by this weekend. I have a conference to go to AND my son's wedding is the next weekend. Have I mentioned I don't have a dress yet? Well, I don't. Hopefully that will be remedied soon. Very soon. So, the cupcake secret ingredient this month is cheese. Yes, CHEESE. I have my ideas and I'm not sharing them. Yet. Other news? Have I mentioned that Maddie has a new book up on Amazon? What? I haven't mentioned that yet? More news? Hm. Keep in mind that this coming Saturday, October 18, is the annual Kentucky Romance Writers booksigning. I'll be signing anything and everything I have that is in print. We'll be at the Joseph Beth Booksellers store in Lexington, KY. I'll be joined by about 14 other romance authors from the region. Now, how can you miss that, huh? And no. I'm not telling you how old I am. You have to guess. And if you are right, I'll send you a virtual cheese cupcake. Seriously. Happy birthday!! Hope it was a good one for you. Guess how old you are?? Do you do the counting backwards until you get to 29 trick? I was busy yesterday hanging wallpaper and didn't spend much time on the computer, so let me wish you a Happy belated birthday Maddie! What kinds of cheese can you use for the cupcakes? Does it have to be straight up cheese (like Cheddar, Mozzerella, etc) or can you use cream cheese, cottage cheese? Sounds like it would be an interesting cupcake, regardless. Can't wait to see what you come up with. Sorry you had to see and hear Austin Powers on your birthday. Thanks for suffering for my blog. Hey, I loved your blog, Jennifer! I thought it was a very clever way to announce your books on Amazon. I feel for it hook, line and sinker. :) Very nice! Taryn, thanks for stopping by. I'm sorry I can't talk about my cheese cupcake quite yet. There could be spies about, you know? anyway, I will say that the cheese is not orange/yellow. Hint. Hint.